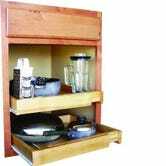 Things have a way of stacking up inside kitchen cabinets, robbing you of storage space and leaving cupboards crowded and disorganized. 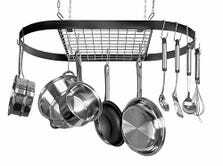 Here's how to free up room for pots, pans, utensils and cans of clam chowder. Reclaim your space and bring order to the busiest room in the home. Your house is the biggest gadget of all. A Gizmodo Home Mod shows you how to recharge it, clear its cache, and update its operating systems. Install dividers in the cabinets to conveniently store pizza pans, cookie sheets, trays and other large cookware vertically so they're easy to grab. You can easily build your own with 1/2-inch lumber and clips, or buy wire-frame versions for about $10. 2. Hang pots from the ceiling. A couple of large pots can eat up a whole cabinet. Instead of stacking them up and then un-piling them to get the size you want, hang them from a rack on the ceiling. They become part of the décor and within easy reach. The lowest priced model we found is $40, with others costing more than $150. 3. Make a broom closet better. Nobody really needs a locker-sized closet to store a few long-handled cleaning supplies. Just mount the broom, mop and Swiffer on the back of the tall door with a multi-item wall organizer. Then use stock lumber to cut some shelves a few inches shallower than the total cabinet depth. (Like, for a 10-inch-deep cabinet, use a 1 x 8 cut to width.) This gives the broom handles room for the door to close and makes a great cleaning supply cupboard. 4. Get control of pot lids. There are a lot of options for storing a clanging mess of pot lids—build a simple rack with dividers, buy slide out slots, or hang this super simple storage rack right over your cabinet door. 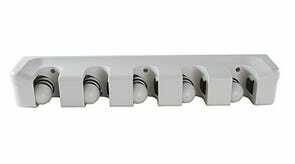 It costs less than $15 and doesn't require screws or fasteners. Just be sure there are no shelves to interfere with the door closing when it's loaded with lids (try under the sink). 5. Attach jars under cabinets. 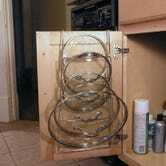 Drill a small hole in mason jar lids, then screw the lids under a cabinet or shelf. Use short wood screws so they don't penetrate through the cabinet bottom. Then fill the mason jars with sugar, salt, or Splenda packets, and twist the jar bodies onto the fixed lids. 6. Install pull out shelves. Shelves that pull out of cabinets are the best thing that ever happened to kitchen storage. They let you easily see, access and maximize the entire shelf. Build them yourself or buy assembled wood or metal pull outs. 7. Add a toe kick drawer. This one takes some carpentry skills, but the payback is huge. Remove the toe kick along the base cabinets, cut a hole in the bottom, and install a drawer. The drawer won't be tall, but it'll be about 2 ft. deep, so it'll hold a lot of stuff, like cookie sheets and cutting boards. Sometimes there's just not enough existing space to put everything. In that case, add a portable island or cart that stores and carries kitchen items. Use 1x2 lumber to build mini-shelves along the back wall of a food cupboard. The shelves only have to be a couple inches high, and they can store spices or canned goods. Grab what you need without moving everything out of the way or knocking the other cans over. Here's the rule—if you haven't used something in a year, it's time to get rid of it. 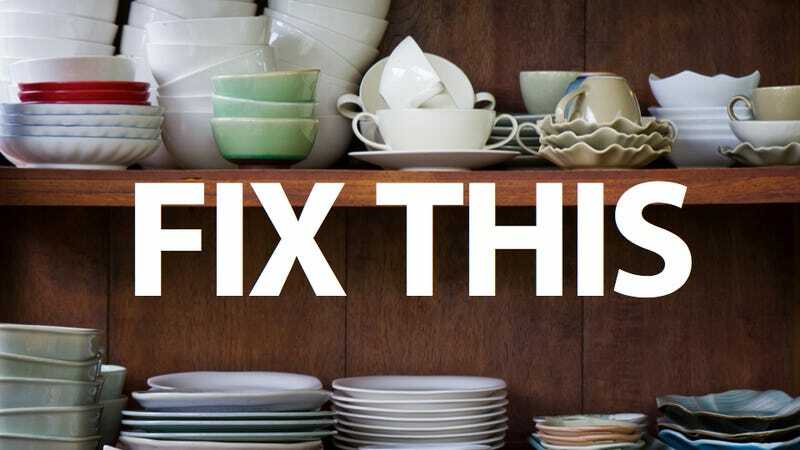 If your shelves are crammed full of redundant pots and orphaned Tupperware containers, toss out the spare stuff and focus on what your kitchen really needs. Image credit: Shutterstock / patpitchaya.